BIREME/PAHO/WHO participated in the Workshop on the dimensions for updating the Observatory Network of Human Resources in Health (HRH), within the framework of the Regional HRH Strategy, held in Panama City on May 8 and 9, 2018 and organized by the Pan American Health Organization/World Health Organization. The Workshop was attended by members and former members of the PAHO/WHO staff that collaborated in the founding of the RHS Observatory, as well as special guests linked to the topic. For more information on the Workshop, access the link. 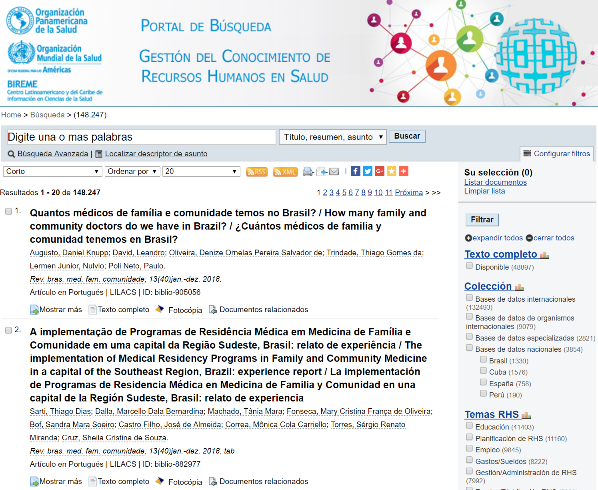 Since March 2017, BIREME/PAHO/WHO has been developing, in coordination with the Technical Unit for Human Health Capabilities of the PAHO/WHO Representation in Brazil, a project to promote knowledge management in the field of Human Resources in Health (RHS). The main objective of the project is to contribute to the definition of a new HRH Development Agenda in the Region of Latin America and the Caribbean, through the identification and analysis of the scientific and technical production published in the field, the extension of the record of non-conventional literature on HRH, such as reports, guides, policies and other technical publications, and strategic actions with existing HRH Observatory Networks in the countries. 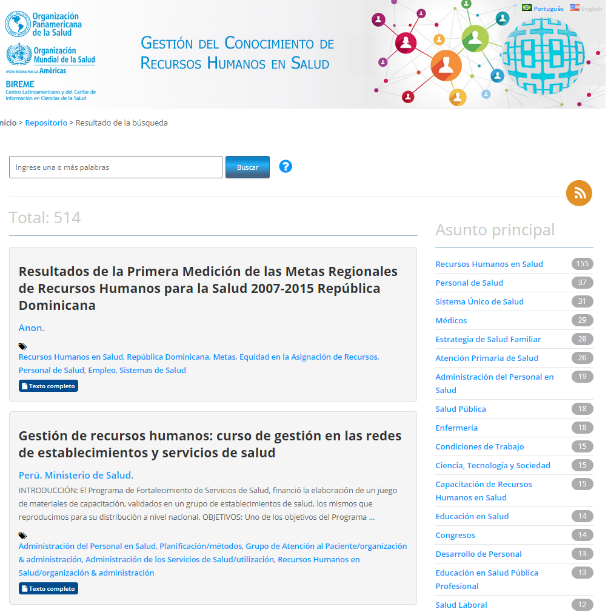 The BIREME/PAHO/WHO team, together with the PAHO/WHO Brazil team and the coordination of the Regional HRH Observatory, are concentrating efforts to collect the scientific and technical production indicated by the HRH Observatory Network and organize it on an online database, with search possibilities, filters by subject, year of publication, type of publication, institution, country of publication, language, etc. It is worthy to note the amount of gray literature (non-conventional literature), which represents, in June 2018, 68% of the contents of the Repository. This database also strengthens LILACS with the entry and indexing of these contents. 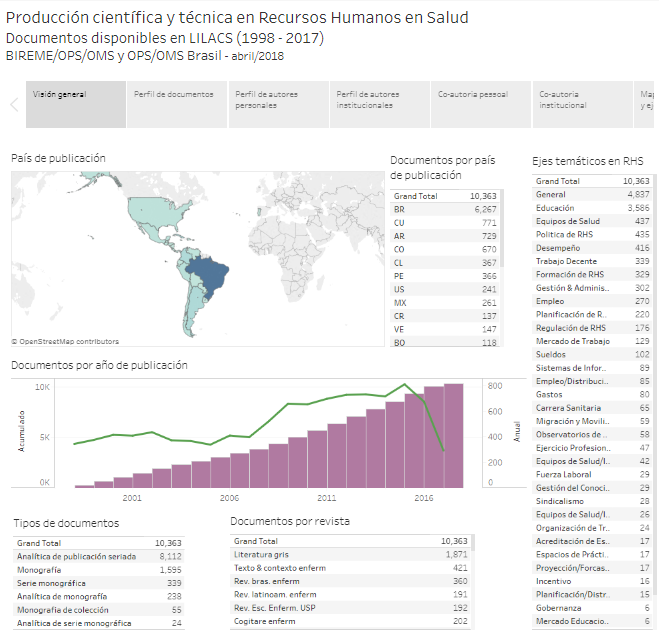 Through specialized information search strategies in the field of HRH, BIREME/PAHO/WHO has created an interface that enables the retrieval of documents published in the main international databases, such as Medline and LILACS, available in the VHL. There are over 148 thousand documents categorized under employment, education, planning, regulation, management/administration, expenses, trade unionism, politics, health teams and information systems. 3. Panels with infometric indicators of the scientific and technical literature on HRH available in the VHL. Using the documents recovered by the information search strategies on the HRH in the VHL, panels with infometric indicators of the scientific and technical production available in LILACS have been developed. Other panels are under development for databases Medline, PAHO-IRIS, WHO-IRIS and HRH Repository. BIREME/PAHO/WHO continues to cooperate on the subject. One of the recommendations of the Workshop, already in the implementation phase, is the development of a subportal in the Regional Observatory of HRH, which will be destined for HRH Knowledge Management. The subportal will integrate the three products that BIREME/PAHO/WHO has developed and that were presented during the event.